Same family owned Mustang since 1980! As the new decade dawned, Ford’s Mustang was on its third restyle. This particular example was built in Ford’s Dearborn, Michigan factory. 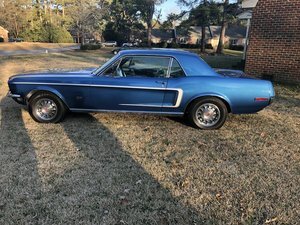 This Mustang is a local friend of ours who\'s mother bought this Mustang in 1980 and passed it to her son in 2014 and is now offered for sale here at Motoexotica Classic Cars. Finished in blue with a power-folding black soft top, this car’s paint and trim are in near excellent condition. The windows are clear and crack-free while the car’s lights, including its dual headlights, are intact and haze-free. The car’s bodywork is straight and, the newer black, power-folding soft top is in good order, the chrome bumpers look great, the engine bay is very tidy and the battery appears new. The Mustang recently had a quality repaint, the color is slightly different than the original blue. The door jams were not repainted at the time and are still original paint color. This Mustang rolls on radials, size 205/75R14 at all four corners. As a touch of irony, this Mustang sports de-badged Buick hubcaps. The tires look excellent while the wheel covers are in satisfactory shape. Under the hood is a 302 CID Windsor V-8 engine mated to a three-speed automatic transmission. Inside, the black vinyl front buckets and rear seat are in excellent shape while the matching black carpeting looks great but do have some sun fading from the years of top down driving. The factory, two-spoke steering wheel is present, the instrument panel is in very good order, the inner door liners are in decent shape and the shift lever looks great. Completing the interior is a factory AM/FM radio. 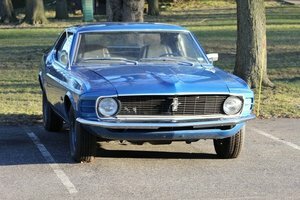 The 1970 model year Mustangs were restyled to be less aggressive and therefore returned to single headlamps which were moved to the inside of the grille opening with ‘fins’ on the outside of the grille sides. Some felt the aggressive styling of the 1969 model hurt its sales and this view prompted the headlamp revisions and simplification of other exterior styling aspects. It\'s worth noting though that 1969 model year sales exceeded those of 1970. The rear fender air scoops were removed and the taillight panel was now flat instead of concave as seen on 1969 models. The interior options remained mostly unchanged. Competition to this Mustang droptop in 1970 included Chevrolet’s Corvette, Dodge’s Challenger, Mercury’s Cougar and Plymouth’s Barracuda. If you prefer later variants of Ford’s first-generation Mustang, you should come by MotoeXotica Classic Cars to check out this blue beauty. This car is currently located at our facility in St. Louis, Missouri. Current mileage on the odometer shows 15,263 miles. It is sold as is, where is, on a clean and clear, mileage exempt title. GET OUT AND DRIVE!!! CLICK HERE TO VIEW OUR YOUTUBE LINK!